One of things that can sometimes confuse people is trying to determine whether they are experiencing breakage or excessive shedding. While both might seem similar, there are big differences between the two as well as different reasons why they occur. At some point in our natural hair journey most of us might have experience one or both of them. In order to get a little understanding of both, I will briefly define what each term means, the potential causes of them and some solutions you can introduce to try and avoid and/or limit both. What is breakage and/or shed hair? Breakage: Breakage is not normal. Breakage will appear obvious because it will be shorter and in varying lengths, depending on where the hair broke off compared to the rest of your “normal” length. The oldest parts of our hair is towards the end and since it is the oldest part we generally experience a little more breakage in that area however, the truth is breakage can occur along any spot of exposed hair. 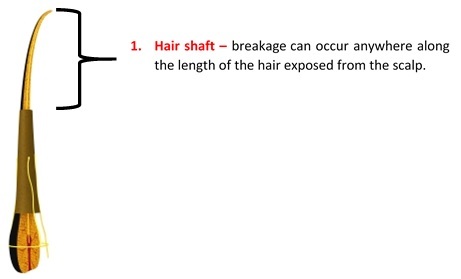 Also, you can distinguish breakage from shed hair because the bulb is still intact in your scalp. More on bulbs later. Shed Hair: – is a normal occurrence. It is hair that has fallen out due to the fact that its growth life cycle has ended. With shed hair you can see the bulb of the hair (see images below) – the place where the hair was growing directly under the scalp. The bulb should not be confused with the root of our hair, which is located deep within the scalp. When hair falls out with the bulb, new hair will sprout back in its place. Whereas, if hair falls out from the root, a new hair strand will not grow back in its place. 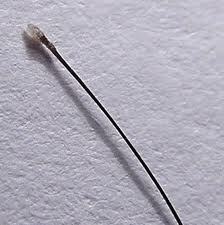 With shed hair the whole strand of hair has falls out intact and the bulb of the hair has a round white shape. The bulb appears white because the hair stopped producing melanin (color) right before it falls out. 1. Moisture Imbalance– to – protein level of our hair, namely a lack of moisture. 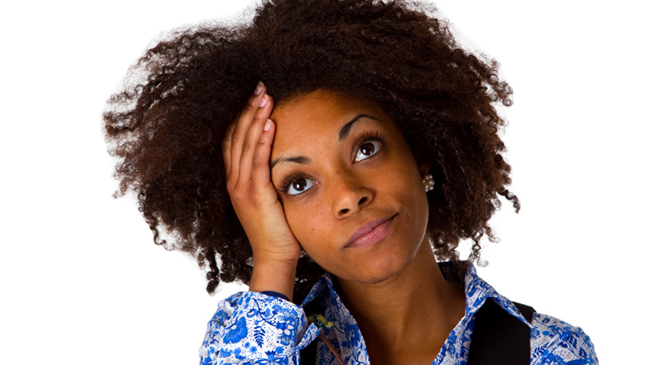 Un-moisturized hair means dry hair and dry hair leads to breakage because the hair lacks flexibility. This due to the fact that the hair lacks normal levels of elasticity which makes it incapable of being stretched (to a certain points) without snapping off. Inelasticity makes the hair weak and prone to major damage. 2. Over manipulation- of your hair and especially not being careful or gentle when dealing with your hair. Natural hair is sensitive, even fragile to over-manipulation, harsh combing/detangling, manipulating while it is dry, chemicals or the overuse of heat. It is ALWAYS necessary to handle natural hair with care. Shedding: It is normal to lose about 50 – 100 strands of hair a day (give or take). However, you want to watch for excessive shed hair because this usually means your hair is lacking protein. Once again, hair shedding can occur if there is an imbalance but in this case it is the imbalance of protein – to moisture levels. Our hair is made up of protein and requires it in order to stay fortified, strengthened from within and to help ‘fill in’ any gaps we might have on the hair’s cuticle due to damage. Because natural hair seems to look like it is strong or even “hard” some of us figure we need to focus only on moisture levels which is incorrect. Natural hair might not require as much protein as it does moisture, but that is not to say it should be ignored. There are also several other circumstances that might cause excessive shed hair such as health issues, pregnancy, hereditary reasons, side effects from medicine or a poor diet. The most obvious solution is to first and foremost, handle our hair like we would our children, with tender loving care and patience. Trying to rush through detangling, forcefully pulling our hair into a bun or ponytail or simply being impatient can cause havoc to our already brittle hair; so please do not do it! Next up is Deep Conditioners. Deep Conditioners are something that every naturalista needs to incorporate in a healthy hair routine. Only you can determine how long and frequently you need to do a protein or moisturizing Deep Conditioner however, it needs to be part of your routine. When it comes to breakage, sometimes our hair is trying to tell us it is damaged and needs a trim. I know that dusting, trimming or cutting our hair is not always a welcomed thought however, instead of trying to hold on a few inches of damaged ends that eventually will break off, trim your ends. As previously mentioned, the oldest part of our hair is towards the end and they are the ones that have been through the most. There is no magic number of how often or how much hair you need to trim but you do want to keep an eye out for split ends, damage, breakage or excessive single strand knots. Protecting your hair and limiting manipulation is also important. Protective styles might not be for everyone and I am not saying you need to keep your hair tucked away 24/7 however, constantly playing or changing up your hairstyle every single day can put a lot of stress on your lovely curls. You can wear your hair out for a part of the week and then tuck it away in an up-do that protects the length and ends of your hair. Another point that needs to be mentioned is having a healthy diet and including exercise into your lifestyle. This actually plays a hug role! It is not only about what we apply topically to our hair but also what we ingest and do for our body internally. We need to “feed” our hair through nutrition since vitamins, minerals and other nourishing benefits we give your body also impacts our hair. Obviously the minimize the use of heat or chemicals to our hair can cause damage, especially over a prolonged period of time. Therefore it is recommended to try and reduce the frequency of heat and chemical use in order to keep limit damage to our hair. If you do use heat it is absolutely necessary to use a heat protectant and an appropriate hair dryer, flat iron or curling wand that has a temperature setting. You can “prep” your hair the night before by doing a protein Deep Conditioner followed by a moisturizing Deep Conditioner so that your hair is fortified and protected before the application of a heat or chemicals. Have you experienced breakage or excessive shedding? If so, what did you do to overcome it?